A deep vein thrombosis (DVT) is a form of blood clot, but it can be more problematic than the average clot. If a DVT breaks off and travels to the lungs or heart, it could potentially be life threatening. Therefore, it’s important for Rhode Island home caregivers to be able to properly identify a deep vein thrombosis and get prompt treatment for the seniors in their care. Where Does Deep Vein Thrombosis Occur? 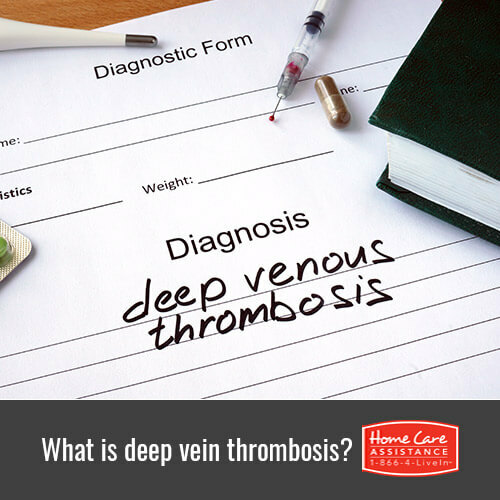 Where a DVT is formed sets it apart from other types of blood clots. It occurs in the deep veins of the body, which are far larger than the small capillaries that run along the surface of the skin. Therefore, a deep vein thrombosis can become very large in size and cause a lot of trouble if it breaks away from the blood vessel wall and travels through the bloodstream. Deep vein thrombosis typically occurs in the legs because there are many deep veins there and it is hard for the heart to pump blood all the way down to these extremities. How Can You Tell If Your Loved One Has Deep Vein Thrombosis? The symptoms of deep vein thrombosis are not always evident. However, the most common signs of one are swelling in the leg and a continuous pain that feels almost like a muscle cramp. Occasionally, the area may also look red and feel warm to touch. If your seniors loved one experiences any of these symptoms, you should have him or her visit a doctor who can use imaging tests like ultrasound and MRI scans to find the clot. If the deep vein thrombosis has not broken away from the blood vessel, then the primary method of treatment is blood-thinning medication to slowly dissolve the clot. In rare cases, surgery may be needed. Once the deep vein thrombosis is treated, seniors should stay active and make lifestyle changes to avoid a recurrence. If your loved one needs help recovering from DVT, contact Home Care Assistance of Rhode Island at (401) 284-0979 today. We provide comprehensive Rhode Island senior home care that helps seniors recuperate from injury and illness, manage chronic disease, and take care of daily activities around the house. In addition to helping your loved one recover from DVT, our expertly trained caregivers offer medication reminders, personal care, and mobility assistance. Don’t forget to set up a complimentary in-home consultation when you call.